Oh boy, one day left until I officially start! It’s hard to believe how much can happen in 24hrs. I flew out of Portland on a red eye flight at 11:15pm last night after a regular day of substitute teaching. I like working up until I leave. I figure I’m taking off the next 5 months so I might as well work as much as I can before I leave. Also, it keeps me distracted and focused when I have something to do. The late flight gave me time to do my final errands before heading out. All went smooth on the flights. I had a brief layover in Chicago and landed in Atlanta by 10am. I took my pack on the plane as I’ve done many times and for the first time I had something confiscated by security…my Nutella! Gasp! It apparently counts as a liquid, but the peanut butter cups got to stay since they were in small containers. Many ask about my hiking poles. I’ve never been stopped and I usually tape a wadded up paper towel over the tips as a precaution. They also have yet to catch my mini lighters buried deep in my pack and my multitool with a knife…not sure if that’s good news for security, but it is for me! When I got to Atlanta, I had friends there to pick me up. I originally met John and Carol last summer in Glacier National Park when they were vacationing and I was finishing the CDT. It turns out they live near the Atlanta airport and they offered to shuttle me to the start of the Approach Trail and hike in a bit with me. 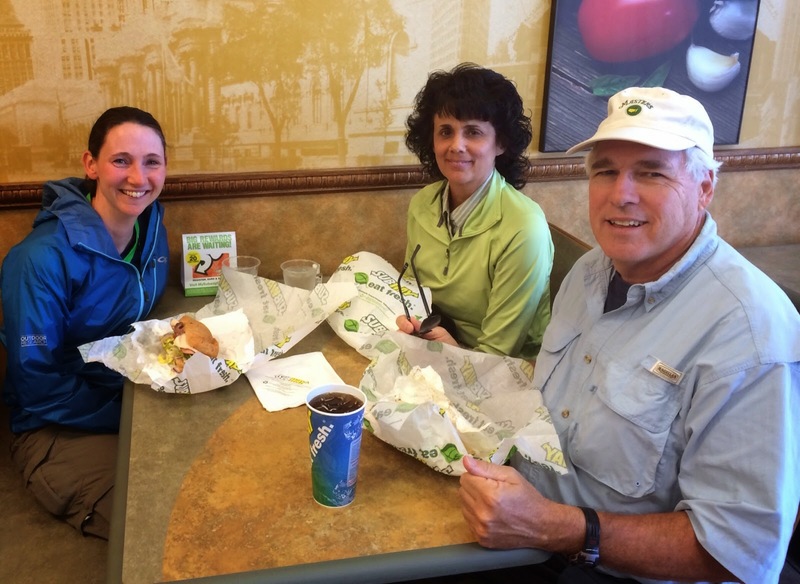 Along the way we stopped for lunch at my first of many Subway stops along the AT. 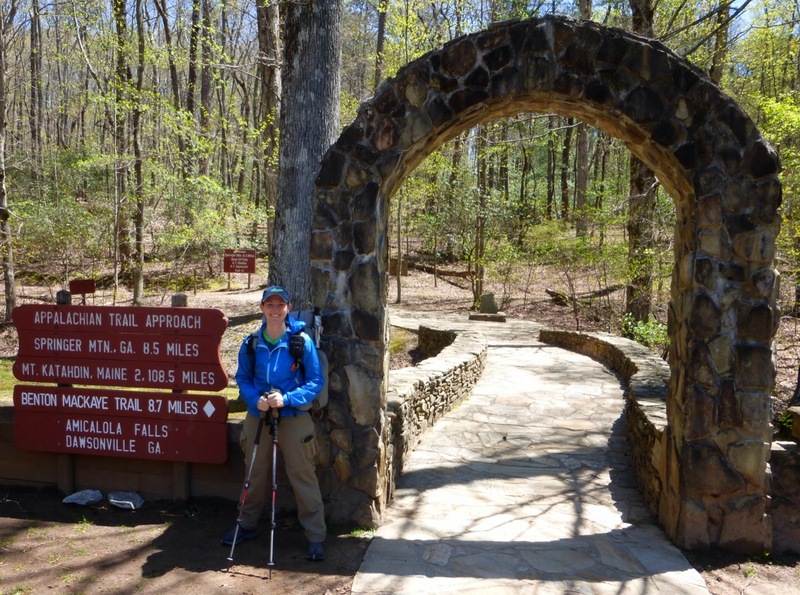 Amicalola Falls State Park Visitor Center is where northbound hikers can sign the official start register. For this year, I am the 1,195th person to sign in and I was the 20th person today. There is even a column to put your pack weight with a scale outside. 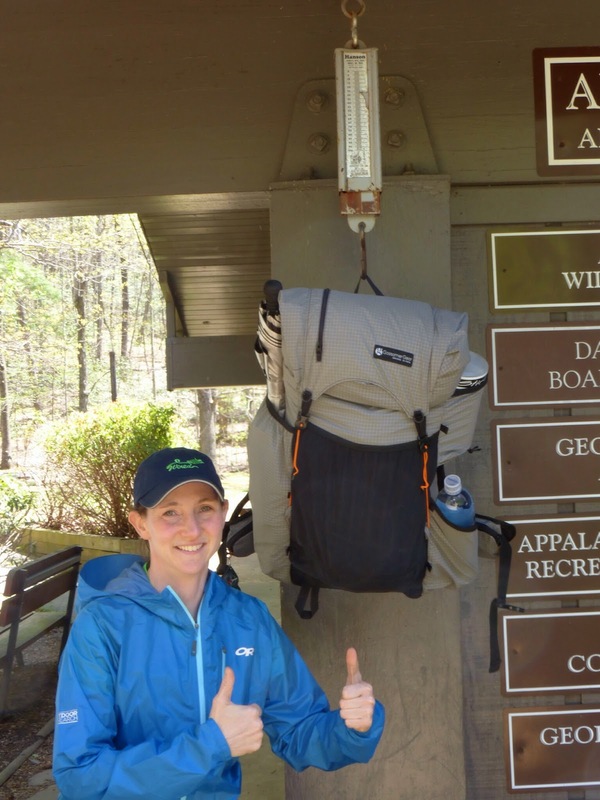 With a liter of water and 5 days of food, my Gossamer Gear Mariposa pack was 27lbs. I was pretty happy with that and most on the list had a pack weight in the 30s. The guy before me had a 52lb pack weight and I wonder if that was a joke. I should see him the next couple of days and will find out. 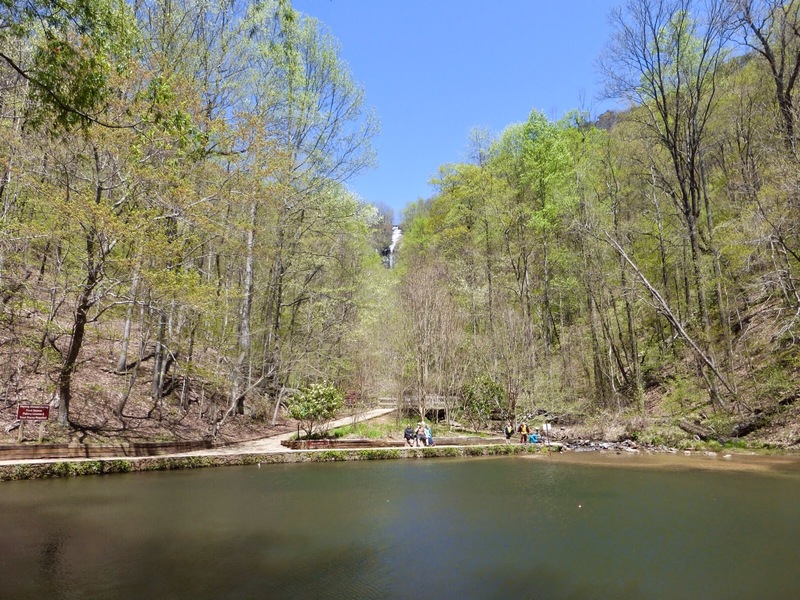 From the Visitor Center, hikers can choose to do the 8.8mi Approach Trail to the official southern terminus atop Springer Mtn or drive directly to the top of Springer to start. I wanted to do the Approach Trail and I was excited to take my start photo at the archway where I’ve seen so many other hikers start their hike behind the Visitor Center. While we were there, another man was with his family and took a photo to commemorate his AT start date in 2007. 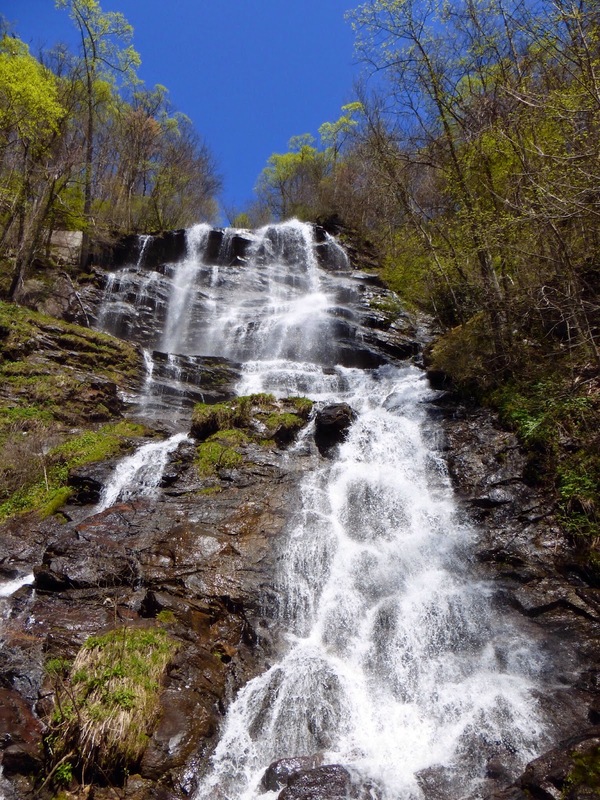 The whole experience at Amicalola Falls was just perfect! It was an adrenaline rush to be at a place that has had such a formative impact on so many people’s lives. Very cool! I hiked the first mile up to the top of the falls while John and Carol drove around and met me up top with my pack. This is technically my first ever slack pack and seemed like the perfect way to start this venture. Everything was absolutely perfect! The weather was ideal in the 50s with a slight breeze. The sky was a clear blue and the trees were colored with various leaves and buds breaking free as I hiked to the top of the falls. I couldn’t stop taking pictures! 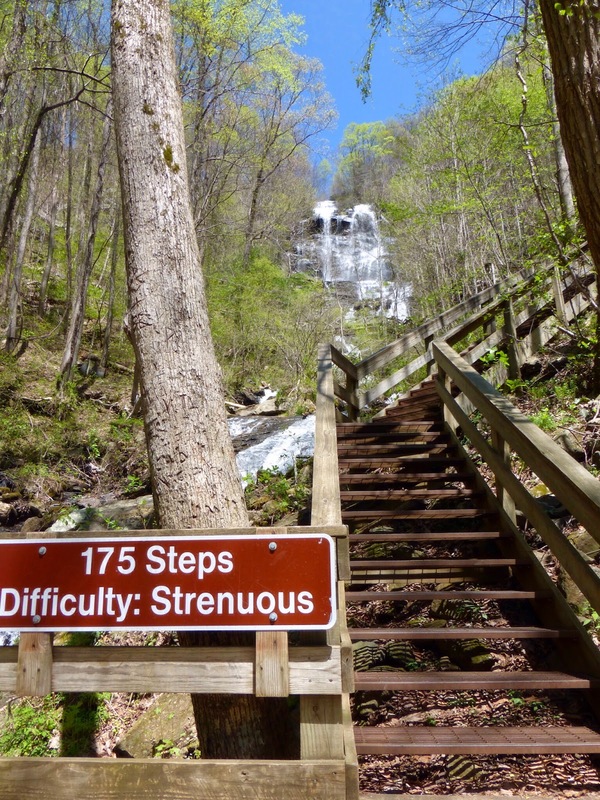 The hike up is also known for the 604 steps that wind and lead to the top of the falls. It was just great! I highly recommend it. 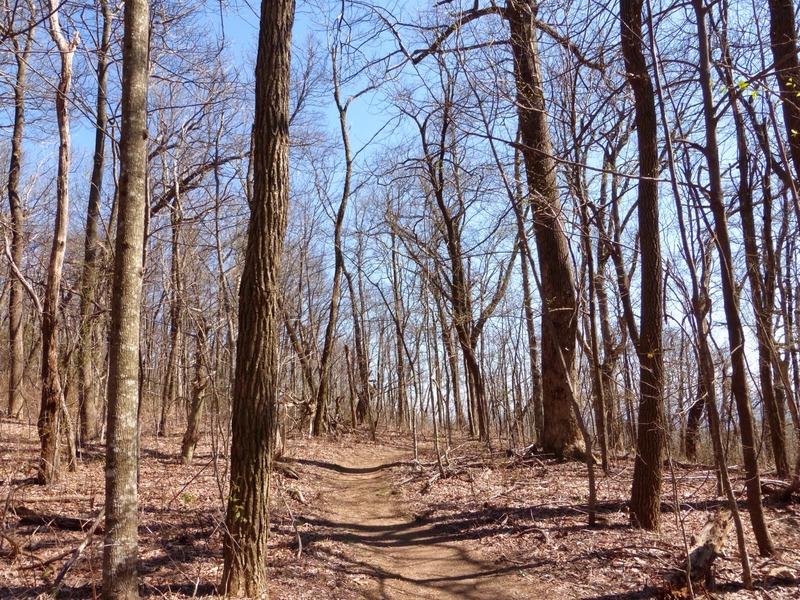 The rest of the day was rolling trail in woods that were still bare and yet to show signs of spring. We found out that just yesterday, there was a dusting of snow and bitterly cold winds. I got lucky dodging that weather! The trail was uneventful the rest of the way to the Hike Inn and what I expected to see. I was surprised at how silent it was out there. I surely thought the birds would be out in full force, but I guess it’s still early. We hiked in 5.4mi of the Approach Trail and then took a 1mi side trail to the Len Foote Hike Inn to spend the night. 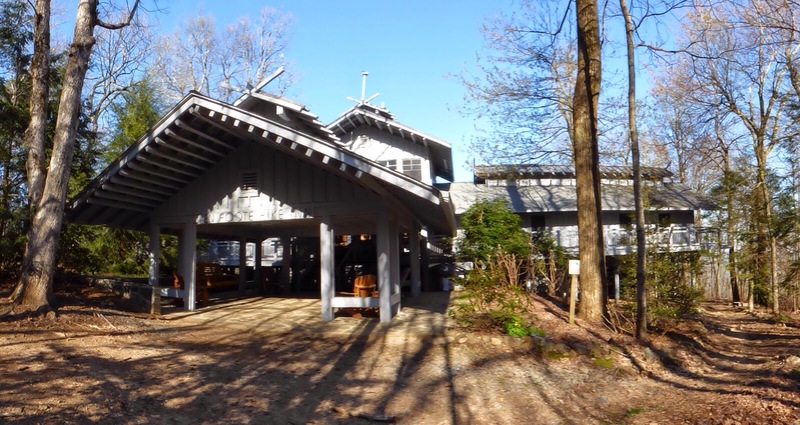 This lodge was the first LEED certified building in Georgia with much of it run off solar power and an impressive composting toilet system. It is very peaceful with 30 people including a few families and space for groups to gather and socialize, take in the view, or play board games. No other thru hikers, but one hopeful young woman who is headed home tomorrow after completing a 7 day stretch. She had a bunch of Nutella packets she wasn’t going to use and gave them to me to replace what the airport took. I just love how the trail balances in that way! We ate a wonderful turkey and mashed potato dinner and enjoyed good company at our table. All of us were tired from the day and turned in to our rustic rooms with bunk beds soon after dinner. It was a great day! I’m quite a happy bunker! Tomorrow I have the other half of the Approach Trail to complete and then I’ll officially start the Appalachian Trail. As a side note, many of you know my tendency to lose things…well I have started this trail out no differently. I forgot to pack a Subway gift card that is now being sent to me. I also forgot to pack wool sleep socks, but happen to have an extra pair of new hiking socks that will now be my sleep socks. To cap it all off, I somehow lost the plug portion to my iPhone since I used John and Carol’s USB plugin in their car. I don’t know what I did with the plug and they are going to check the car for it tomorrow before I order a new one. Good news is I have my adapter with USB ports so I can still charge the phone. I’m just pissed at myself for continually losing crap, ugh! Amusing for all of you readers, but very frustrating for me that I’m so forgetful sometimes!